Definition at line 39 of file DebugLinesSubsection.h. Definition at line 45 of file DebugLinesSubsection.h. 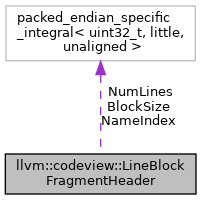 Referenced by llvm::codeview::DebugLinesSubsection::commit(), and llvm::codeview::LineColumnExtractor::operator()(). Definition at line 40 of file DebugLinesSubsection.h. Definition at line 44 of file DebugLinesSubsection.h.